Many people in the Delaware and Lehigh Valleys enjoy watching television without using cable or satellite television, relying instead on an antenna. But the household antenna has changed a lot in recent years, and can make the difference between being able to see your favorite shows and being stuck without a signal. Picking up 6abc relies more than anything on having the right antenna. A lot of cord-cutters purchase what are called HD antennas. Some of these are flat panels, others are units with no or very small small "rabbit ears" and they are presented for indoor use. Other viewers have UHF only antennas made for outdoor positioning. If you are using an indoor antenna it needs to be near a window that faces towards The City of Philadelphia. For best all around results, you will likely want to have an all-band antenna that covers Low-VHF, High VHF and UHF. It needs long elements (rabbit ears) and they should be fully extended for Channel 6. An outdoor antenna is also more likely to bring in a strong signal. There is a consumer website called Antennaweb.org. It is run by the National Association of Broadcasters and the Consumer Technology Association. Enter your address and it will tell you the signals you can receive and the type of antenna you need to have. 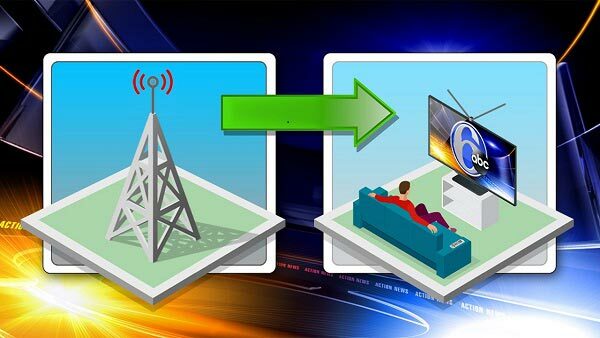 6abc has the strongest signal in the area, but because we are on a low-band VHF frequency the signal is subject to a lot of interference from electronics such as light dimmers, pool pumps, vacuum cleaners, etc. It is the same interference you may remember from older days of watching television, but instead of seeing lines on your screen and a whining noise, now you get a blank screen. You can do a test to see if there is local interference getting in the way of your signal. Get an old-fashioned AM radio and tune it to an unused portion of the band (somewhere between 600-800 khz) and listen for a buzz. If you hear one, there is a source of interference nearby. That might hurt indoor reception as well. Look around and see if you can identify the problem. If you can turn it off, or move it, you may see an improvement. Watching television with a digital antenna isn't like the old days of watching TV with a fuzzy, hazy signal. Digital, over-the-air television is a high definition experience that even allows you to see stations' digital extra channels, like our Live Well Network and Laff TV.